Standing chest presses at a standard gym usually mean staring at a wall, a mirror, the floor, just about anywhere to avoid awkward eye-contact with your fellow sweaty, red-faced exercisers. It’s about as far from an immersive virtual reality experience as you can get. “Video games as exercise” is not a new concept. Dance Dance Revolution has been around since the 1990s, for example. 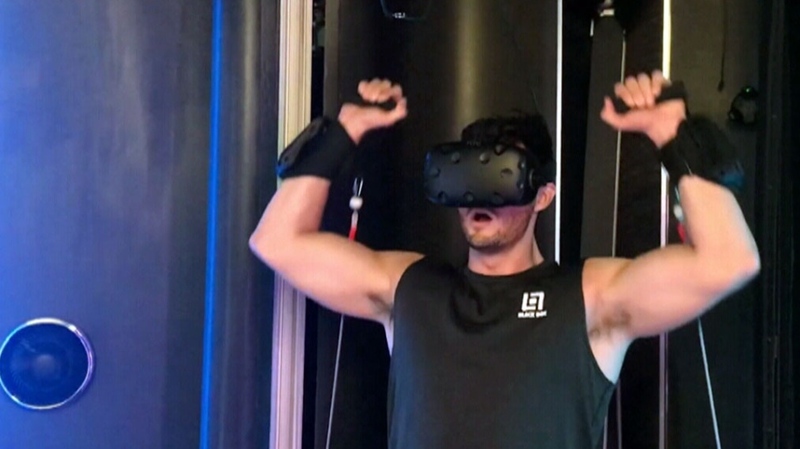 Now, an Idaho-based startup called Black Box VR is aiming to take that idea to the next level by combining virtual reality and resistance training. With Black Box VR, those mundane chest presses are also your best defence against enemies in a virtual arena. By extending your arms, engaging your chest and shoulder muscles, you can launch projectiles to stop a barrage of meteor-like objects being hurtled your way. He may have a point. The World Health Organization recently announced it will include a condition called “gaming disorder” in its latest International Classification of Diseases. No similar plans have been announced regarding weightlifting. “You come out of it and you realize that you worked harder than you ever would have at the gym,” Deluca said of the workout experience. Promotional materials on the company’s website suggest Black Box VR will incorporate plenty of video game-style motivators to keep you focused on the play and not the pain -- things like scores, strength levels, and mythical creatures. The game itself comes through an HTC Vive headset, and uses motion tracking bands. The real-world weightlifting is done with proprietary exercise hardware that looks similar to cable-based gym equipment. The company recently turned heads at the 2018 Consumer Electronics Show in Las Vegas. Black Box VR was named a CES 2018 Innovation Awards Honoree. Deluca said the company plans to open its first VR gym in San Francisco in August, ahead of a broader U.S. roll-out. The real-world weightlifting is done with proprietary exercise hardware that looks similar to cable-based gym equipment.